Over four years of research have led to the definitive book detailing the true story behind the little Italian chapel, built in Orkney during World War II. The Italian chapel created on the island of Lambholm in Orkney was constructed by Italian prisoners of war, from two World War II Nissen huts, exceptional artistic talents and a need for some measure of peace. During World War II, Italians taken prisoner in Africa were shipped to the seemingly inhospitable Orkney islands to assist with the building of the Chuchill Barrier defences. This new book; Orkney’s Italian Chapel: The True Story of An Icon, written by Philip Paris, charts the trials and tribulations faced by these men and how their passion driven skills transformed this small southern Orkney Island. Like Philip and his then new wife Catherine, we too were left speechless at the awe inspiring artistry and skill, wondering about the lives of the men who created from the heart, something so breathtakingly beautiful in a time of such darkness and despair. Philip went on to find out more and for over four years tracked down the former POWs of camp 60, their relatives and people of the islands, to give a deeper insight into the lives of the prisoners and how their presence affected Orcadian lives. The book starts with a detailed history of why the Italian prisoners ended up in Orkney, how enemies became friends, their uncertainty and fears for themselves and for loved ones back in Italy. As the book unfolds, it brings some understanding of the minds of the craftsmen, only serving to make the chapel that they created, even more poignant. Many previously unseen images and stories from the prisoners’ descendants are included in the book, which help to bring the chapel to life and show what it meant to the men who built it. One of the small details I noticed when walking through the stunning rood screen, was a small metal heart inlaid in the floor under the gates. I thought that this was merely a craftsman’s flourish but Philip’s book reveals a true war torn love story. For anybody interested in this wonderful Italian chapel or indeed the lives of those during the Second World War, this book is an absolute must read. Well researched and presented, Philip has brought us closer to the men of Camp 60, who’s inspiring stories, led to one of the greatest icons of peace and hope, ever to come out of the Second World War. Philip Paris was brought up in Gateshead. He entered the printing industry on leaving school before moving to Royal Tunbridge Wells in 1983 to take up a job as a reporter for Printing World magazine. He worked in various trade press journalist/editor rolls until he joined a PR company in Esher that specialises in graphic arts. Still with them, but now living in the Highlands, he writes about his passion with the Italian chapel on Lambholm. 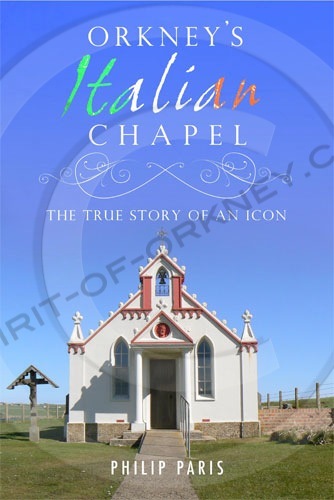 Orkney’s Italian Chapel; The true story of an icon, is published by Black & White Publishing and will be launched at a book-signing event at Waterstones bookstore in the Eastgate Centre, Inverness, at 7pm on Thursday, 10th June 2010. Mr Paris will give a talk at Nairn Book Festival earlier the same day. There is no charge for entry to the book signing. Spirit of Orkney – Article on the Italian Chapel of Lambholm. Philip Paris – Other books written by this author and his biography.